“If these delicate feet could dance, the spaces would echo with tears, but the room is silent and visitors come in and out, and the windows reveal young girls outside, in imagined old leotards and ballet shoes, scuffed with time, practicing, practicing for . . . le danse. 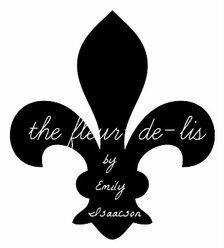 Thus begins The Fleur-de-lis, an 800 page document in poetry by Emily Isaacson sent to Prince William over 5 years. Unlike a ballet in literature, experience the richness and depth of her postmodern verse, and the beauty and nuances of the local countryside and art. This volume of postmodern poetry is Canadiana literature in bloom: the sea, the stars and the North all appear at Emily’s eloquent table. The perspective stemming from her disciplined art, its prolific influence, her painterly presence, her sense of decorum, and nicely, the silver thread throughout her epistle of romance all establish Emily as a prominent poet of Canadian birth. The Fleur-de-lis captures the simple essence of both martyrdom and liturgy, memorizes the moments of soul, and makes the sacred a poignant and lyric capture. A literary monument, this reflective work of poetry is both mythic and contemplative. India Passage was written by Emily Isaacson in 2006, inspired by Walt Whitman's "Passage To India." Emily Isaacson's riveting collection is free verse pieces, and after 25 years of crafting poetry, her lyrical voice and practiced ear produce a carefree and lilting result: the sea, the journey, the ship all come to life in this postmodern poetry with romance and spiritual transcendence as destination. The Emily Isaacson Institute was originally founded for research and education in literature, the arts, and medicine. Located in Mission, British Columbia, they featured the writing and analog photography of Emily Isaacson, her work and legacy. A regular visitor of Westminster Abbey here in the mountains, her writing reflected the solitude and mythology of the Canadian wilderness, the sea, the stars and the First Nations people. asking to eat at this fortunate table. To buy, contact us directly as the publisher is in transition, and we have copies that are available for sale at the Canadian price. The Abbotsford News, Abbotsford, B.C. Quote from the Foreword . . . The Fleur-de-lis is a partaking of spiritual renaissance, defined by the cloistering and chastisement of martyrdom itself. In the text we see the richness and depth of the poet’s diametrically established and ordered world. Piecing together the journey of royalty from humble beginning to glittering coronation, the poet is given to birth and pierced by nature. The language of verse speaks as medium, chronicling human nature in all its pathos and gestation.